New board and management must get on with their work, however tough it may be, write Duduetsang Makuse and Justine Limpitlaw. Last year, Parliament’s ad hoc committee on the SABC issued its groundbreaking report, which examined the public broadcaster’s disastrous financial position; its numerous wrongful staff appointments; and the overall lack of independence of the SABC, characterised by ministerial interference. After former chief operating officer Hlaudi Motsoeneng’s expensive and futile court battles, the high court endorsed the SOS Support Public Broadcasting Coalition’s view that the SABC was not an ordinary state-owned enterprise and needed to be independent. Parliament acted swiftly to appoint a competent and independent board, whose credentials are excellent.In turn, they acted swiftly to bring in talent. The executive got to work on developing a much-needed turnaround plan to right the sinking ship. And there was a lot to turn around. The biggest problem was – and is – a salary bill of R3.1 billion that was entirely unaffordable. It was clearly untenable and jeopardises the financial sustainability of the SABC. As part of its turnaround plan, the SABC gave notice, publicly, that retrenchments were in the mix. In the uproar that followed, you would have been forgiven for forgetting that cost-saving measures, which included a reduction of the wage bill, were among the terms and conditions that were ordered by then finance minister Pravin Gordhan when he gave the SABC a government bank guarantee of R1.47 billion in 2009. The SABC managed to turn itself around and pay back part of the loan given to it by Nedbank on the back of the government guarantee.
. Reduce professional or consultancy fees by R136 million. In 2012, Motsoeneng went on a hiring and purging spree, among other activities that Parliament later categorised as wasteful and irregular expenditure. A layer of mid-level managers was hired unlawfully essentially to carry out Motsoeneng’s directives. The Special Investigating Unit issued a summons against Motsoeneng for R21 million, which included R11 million in bonuses and R10.7 million in damages related to irregular appointments and dismissals of staff during his tenure. Additionally, the Public Protector and the Auditor-General have made detailed findings in respect of Motsoeneng’s unlawful and wasteful staffing bloat. One would have thought that Parliament would have reacted with rueful sympathy for SABC management given the predicament it inherited, especially considering its own woeful lack of proper oversight of successive failing SABC boards and executive management. The DA demanded that the executive directors’ salaries immediately be disclosed – they are always disclosed in the annual report. But, instead of simply writing to the SABC requesting this, the DA went via the minister of communications, the Cabinet position responsible for historically egregious and unlawful interference in SABC affairs going back more than a decade. Said minister thus had grist for her mill of attacking the SABC’s proposed retrenchments, with certain unions whose unflagging support for Motsoeneng is a matter of public record. Parliamentarians have insisted that retrenchments cannot be a first port of call. They are right to say so. But a cursory reading of the SABC’s turnaround plan makes it clear that retrenchments have been proposed as a last resort and are not the only or even the primary plan to reduce cost drivers. The DA has tried to make out that transparency at the SABC is somehow at risk. But anyone who has engaged the SABC recently – whether in one of its independently conducted investigations into political interference or sexual harassment, in its face-to-face town hall meeting with content producers or in its public forums with civil society – knows that the open stance of the SABC is a breath of fresh air. The adage is that a fish rots from its head. But the opposite is true – good leadership can effect great change. The public is justifiably fed up with poorly run state-owned enterprises demanding handouts – Denel, the SA Post Office and SAA are all clamouring for bailouts. The SABC is lumped in that category. However, the SABC has not been a bad bet in this regard. It has paid back, with interest, the previous bank loan guaranteed by government. Despite its dire financial situation (it is technically insolvent), it is not requesting a bailout – that is, actual money to be given to it out of our taxes. It is asking for a government guarantee to give its creditors and lenders some comfort that government is behind the SABC’s leadership, and to give it time to implement its proposed strategy. The SABC is the single largest provider of news and current affairs to the people of this nation and it will remain so for a very long time … including through next year’s election. The rich might not rely on it, but the masses do. Supporting it so that it can be a proper public broadcaster that provides excellent and credible programming is the best defence of a democracy. Parliament did its fundamental job some months ago – it appointed a good board. Sadly, since then, it has repeatedly postponed making the board appointments necessary to fill vacancies. The public interest requires it to fill board vacancies, not to attempt to manage the SABC’s finances and human resources operations. So, what now? Parliament and the minister are aligned in what they clearly see as a vote-winning tactic to fight retrenchments – as if those are at the heart of the SABC’s plans, as if these won’t be done in accordance with the Labour Relations Act or last week’s Constitutional Court judgment on retrenchments. It appears that they both agree with the minister’s recent statement that the wellbeing of the SABC is “not the exclusive domain of the staff and its management”. They are both incorrect in law on this as section 13(11) of the Broadcasting Act explicitly provides that the SABC board “controls the affairs of the corporation”; section 13(13) makes it clear that the board “is the accounting authority of the corporation”. Neither the minister nor Parliament can or should assume such roles. We say: Let the SABC board and management get on with its work. If the SABC acts unlawfully around retrenchments, civil society and the unions will, of course, head to the courts. 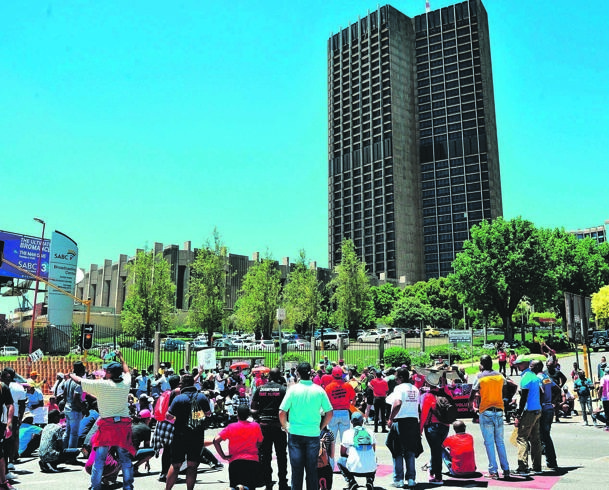 Do you believe there’s hope of reviving the SABC?